Dayvione Briggs signs her National Letter of Intent while her mother, Tiffany, and assistant track coaches Brandon Biggom and Claude Holland look on. 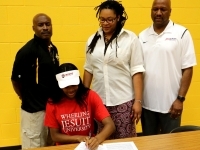 Heights High graduate Dayvione Briggs, a standout track and cross-country athlete, has signed a National Letter of Intent (NLI) to compete in track and field at Wheeling Jesuit University starting this fall. Briggs graduated from Heights High in May, and had a decorated four-year career in cross-country and track. Now, she has received a scholarship to continue her athletic career on the collegiate level at Wheeling Jesuit. Briggs expects to compete in the 100-meter hurdles, 400-meter hurdles, and heptathlon events for the Wheeling Jesuit Cardinals. A three-time Lake Erie League cross-country champion, Briggs took home the individual titles in 2013, 2014 and 2016. She helped the Tigers to the LEL team championship as a senior in 2016. Briggs was just as effective on the track for Heights High. This past spring, she was the first Heights High female to qualify for the state meet in three years. She placed fourth in the 100-meter hurdles at the regional meet to qualify for state competition.